Business is doing well, and your manufacturing is ramping up. That means your quality inspections need to speed up. Now you are looking for some digital indicators. As well as your dial and test indicators work, you need to streamline your quality process. Digital indicators give you an advantage. They let you collect the data and output that data to a printer or SPC program without any operator error. Move the workpiece and press the button on the digital indicator. No longer do you have to manually input data. Use the Min (minimum) feature for your rocking-type bore gage applications. 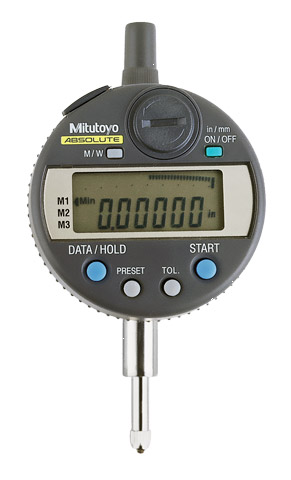 Try the Max feature on the digital indicators when you are measuring outside diameters on a bench comparator. Just roll a part under the digital indicator and read the largest dimension detected. Productivity Quality, Inc provides a variety of digital indicators from all leading maufacturers: Brown & Sharpe, Mitutoyo, Mahr Federal, Fowler, Starrett, SPI and more.